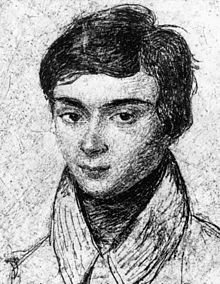 Évariste Galois (October 25, 1811 – May 31, 1832) was a French mathematician, who, while still in his teens, developed the well-known Galois theory. Galois theory is capable to determine whether a polynomial with rational coefficient can be solved by radicals and give a clear insight about what kind of length ratio can be constructed by compass and straightedge, thereby solving the long-standing problems of solving a polynomial by radicals. His life is considered to be one of the most romantic in all of mathematics because of the contributions he has made in such a short span of life. ... un auteur ne nuit jamais tant à ses lecteurs que quand il dissimule une difficulté. ... an author never does more damage to his readers than when he hides a difficulty. in the preface of Deux mémoires d'Analyse pure, October 8, 1831, edited by Jules Tannery (1908). Manuscrits de Évariste Galois. Gauthier-Villars. p. 27. Il parait après cela qu'il n'y a aucun fruit à tirer de la solution que nous proposons. It seems there is no fruit to be drawn from the solution we offer. Ne pleure pas, Alfred ! J'ai besoin de tout mon courage pour mourir à vingt ans ! Don't cry, Alfred! I need all my courage to die at twenty. Quoted in: Léopold Infeld (1978) Whom the gods love: the story of Évariste Galois. p. 299. [This] science is the work of the human mind, which is destined rather to study than to know, to seek the truth rather than to find it. Of mathematics — as quoted in Mathematics: The Loss of Certainty (1980) by Morris Kline, p. 99. Langlands and Grothendieck are both (at least) Giants by any measure, and both were consciously successors of Galois. Michael Harris (18 January 2015). Mathematics without Apologies: Portrait of a Problematic Vocation. Princeton University Press. p. 24. ISBN 978-1-4008-5202-4. Since my mathematical youth, I have been under the spell of the classical theory of Galois. This charm has forced me to return to it again and again. Mario Livio (19 September 2005). The Equation that Couldn't Be Solved: How Mathematical Genius Discovered the Language of Symmetry. Simon and Schuster. p. 90. ISBN 978-0-7432-7462-3.